Order for delivery of Precious Ultimate Festival Bouquet to your special one. Our Floral Arrangement is the quintessential Bouquet for festive which holds 18 Yellow Roses trimmed with Fillers and wrapped with Tissue. Offer the special people in your life this Passionate Seasons Greetings Collection and make their hearts leap in joy. 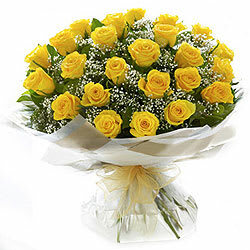 This Flowers Bouquet comprises of 24 Yellow Roses enriched with Fillers and enfolded with Tissue. Offer the special people in your life this Passionate Seasons Greetings Collection and make their hearts leap in joy. This Flowers Bouquet comprises of 30 Yellow Roses enriched with Fillers and enfolded with Tissue.